A suitable soil environment is important for the healthy growth of plants.This means having ideal soil conditions, adequate water, sunlight and plenty of nutrients for your plants. VIVOSUN 3-in-1 Soil Meter helps you know your soil more clearly and care your plants more rationally,it will help you to avoid some of the common mistakes made by gardeners such as over or under watering, planting in an area with insufficient lighting and even highlight potential issues with soil that is too alkaline or acidic.Your plant with this product can grow happily and you become a well growner easily. VIVOSUN store focus on plant growth and with high quality customers service,if you have any questions please feel free to contact us. 1. Don't touch the stone or hard objects which are easy to damage the probe. 2. Clean and wipe the probe after using. 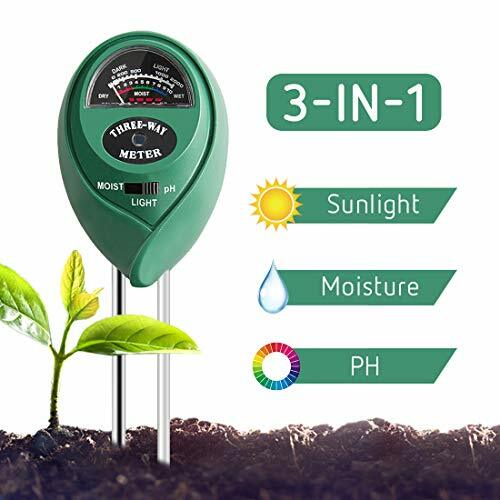 3-in-1 Plant moisture sensor meter can test soil moisture light and pH (Design for testing soil ONLY. Do not be used to test pure water or other liquid). Let you know your soil when to water, control pH level, determine if plant getting adequate light. Moisture Range:1-10(dry to moist);Light range: 0-2000(low light to strong light); pH range: 3.5-8 (acidic to 8 basic). Compact and portable design for indoor/outdoor use good for gardener or planter. Durable and easy to use, plug and read,no battery needed.